Kick off your visit on the 16th (Fri): catch a ride on Monte Solaro, steep yourself in history at Villa San Michele, kick back and relax at Marina Grande Public Beach, then pause for some photo ops at Natural Arch, and finally contemplate the waterfront views at Marina Piccola. Here are some ideas for day two: take in the spiritual surroundings of Chiesa San Michele, then get to know the fascinating history of Scala Fenicia (Phoenician Steps), and then delve into the distant past at Villa Jovis. To find other places to visit, where to stay, and other tourist information, read Capri trip planning site . Newark, USA to Capri is an approximately 16-hour flight. Traveling from Newark to Capri, you'll lose 6 hours due to the time zone difference. Traveling from Newark in September, you can expect nighttime temperatures to be a bit warmer in Capri, with lows of 68°F. Finish up your sightseeing early on the 17th (Sat) so you can travel to Rome. Your itinerary includes some good beach time at V Lounge Beach Club and Acqua e Sale - Stabilimento Balneare. 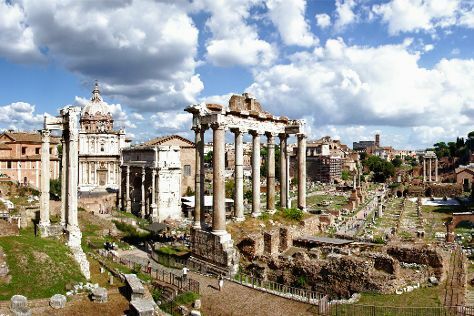 Your inner history buff will appreciate Palatine Hill and Colosseum. Change things up with a short trip to Sabbianera Super Beach in Anguillara Sabazia (about 46 minutes away). It doesn't end there: wander the streets of Trastevere and get to know the fascinating history of Centro Storico Associazione Centro Storico. For maps, traveler tips, photos, and other tourist information, read our Rome trip app . Traveling by combination of ferry and car from Capri to Rome takes 3.5 hours. Alternatively, you can do a combination of ferry and train; or do a combination of ferry, subway, and train. Plan for slightly colder nights when traveling from Capri in September since evenings lows in Rome dip to 60°F. Finish up your sightseeing early on the 20th (Tue) so you can catch the train to Florence. 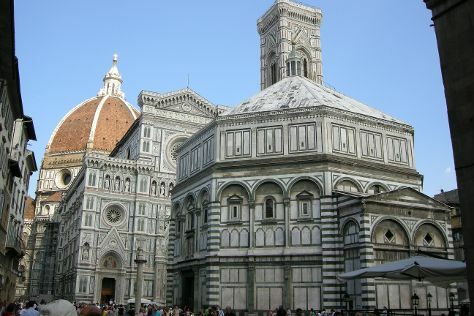 On the 21st (Wed), take in the spiritual surroundings of Cathedral of Santa Maria del Fiore, then enjoy the sand and surf at Easy Living - Spiaggia sull'Arno, and then admire the masterpieces at Uffizi Galleries. Get ready for a full day of sightseeing on the next day: awaken your taste buds at some of the top wineries in the area, do a tasting at Guardastelle Vineyard, and then get great views at Basilica San Miniato al Monte. To find photos, other places to visit, ratings, and tourist information, refer to the Florence travel route builder . You can take a train from Rome to Florence in 2 hours. Alternatively, you can drive; or fly. In September, daily temperatures in Florence can reach 78°F, while at night they dip to 59°F. Finish your sightseeing early on the 22nd (Thu) so you can take a train to Bologna. On the 23rd (Fri), take in the architecture and atmosphere at Basilica - Santuario di Santo Stefano, contemplate the long history of Basilica di San Petronio, then do a tasting at Azienda Agricola Botti di Bovina Fabio, and finally soothe aching muscles at Massaggio Californiano. Keep things going the next day: get to know the fascinating history of Le Mura, then pause for some serene contemplation at Chiesa di Santa Maria della Vita, and then let your taste buds guide you at a local gastronomic tour. 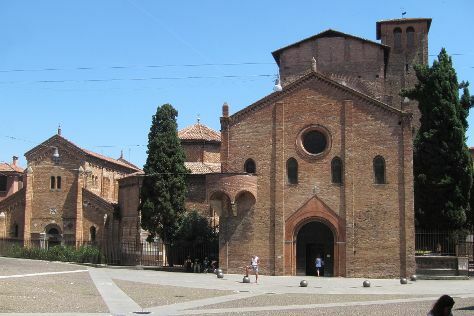 To see more things to do, other places to visit, where to stay, and more tourist information, use the Bologna trip site . Getting from Florence to Bologna by train takes about an hour. Other options: drive; or take a bus. September in Bologna sees daily highs of 78°F and lows of 59°F at night. Finish up your sightseeing early on the 24th (Sat) so you can go by car to Venice. For more things to do, maps, other places to visit, and more tourist information, you can read our Venice trip planner . Drive from Bologna to Venice in 2 hours. Alternatively, you can take a train; or take a bus. Expect a daytime high around 77°F in September, and nighttime lows around 59°F. On the 25th (Sun), wrap the sightseeing up by early afternoon so you can travel to Taormina. Start off your visit on the 26th (Mon): tour the pleasant surroundings at Villa Comunale, then enjoy the sand and surf at Lido Playa Sole Luna, and then tour the pleasant surroundings at Lido La Dolce Vita. Here are some ideas for day two: steep yourself in history at Piazza Duomo and then explore the ancient world of Ancient Theatre of Taormina. To see traveler tips, reviews, where to stay, and more tourist information, read our Taormina route planner . Traveling by combination of flight and train from Venice to Taormina takes 5.5 hours. Alternatively, you can do a combination of train and ferry; or do a combination of car and ferry. Expect a bit warmer evenings in Taormina when traveling from Venice in September, with lows around 69°F. 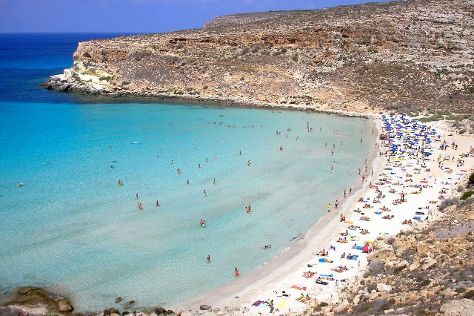 Finish your sightseeing early on the 27th (Tue) so you can travel to Lampedusa. Start off your visit on the 28th (Wed): don't miss a visit to Archivio Storico Lampedusa, then meet the residents at Centro di Recupero Tartarughe e Fauna Selvatica WWF, then kick back and relax at Spiaggia dei Conigli, and finally make a trip to Santuario di Nostra Signora di Lampedusa, Lampedusa. Keep things going the next day: look for gifts at Il Pescato Di Lampedusa S.A.S. Di Costa Antonino & C., get outside with Mare Morto, then look for gifts at Il Veliero di Lampedusa, and finally enjoy the sand and surf at Sciatu Persu. To find ratings, more things to do, and other tourist information, refer to the Lampedusa vacation maker tool . Getting from Taormina to Lampedusa by combination of train and flight takes about 4 hours. Other options: do a combination of car and ferry; or do a combination of train, bus, and ferry. Expect a bit warmer evenings in Lampedusa when traveling from Taormina in September, with lows around 75°F. Wrap up your sightseeing by early afternoon on the 30th (Fri) to allow time for travel to Alghero. Your itinerary includes some good beach time at Spiaggia Mugoni and Porto Ferro. Explore hidden gems such as Azienda Agricola Leda' d'Ittiri and Nuraghe di Palmavera. When in Alghero, make a side trip to see Centro Storico Bosa in Bosa, approximately 58 minutes away. Next up on the itinerary: see majestic marine mammals with a dolphin and whale watching tour, join in the after-dark buzz at Maracaibo Cocktail Bar, and get outside with Spiaggia Torre del Porticciolo. To find traveler tips, other places to visit, ratings, and more tourist information, you can read our Alghero day trip app . Traveling by flight from Lampedusa to Alghero takes 6.5 hours. Expect little chillier evenings in Alghero when traveling from Lampedusa in September, with lows around 60°F. Wrap up your sightseeing on the 3rd (Mon) to allow time to travel back home.